Today Calvados is quite simply the world’s most celebrated apple spirit – known as applejack in the USA and jablkovice in this country. In 1588, El Salvador, a Spanish warship of Philip II’s armada ran aground near the town of Bayeux, Normandy. From this event the area acquired the name of El Calvador. This became so ingrained that in 1790 it became a French département under its present name Calvados. 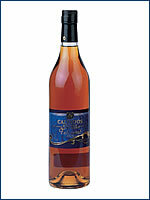 Since the beginning of the 19th century the name Calvados was also applied to the brandy distilled from Normandy apples. Calvados was awarded Appellation d’Origine Contrôlée (A.O.C.) status in 1942 and since 1998 there are a total of three regional appellations, with the best coming from Pays d’Auge to the east of Caen, followed by the Domfrontais. Finally, the generic Calvados A.O.C. 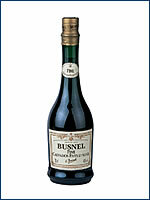 is made from cider, the basic tipple of Normans and Bretons alike, and must be aged for at least two years. In all there are over 12,000 orchards producing cider apples, 550 private producers and 70 co-ops, yielding 35,000 hectolitres annually, though apple spirits produced in other parts of Normandy can only be labeled as eau-de-vie de cidre de Normandie and lack the finesse of that from the Calvados region. The apple cider is distilled twice in copper stills called alambic a` repasse (Pays d’Auge) or alambic a` colonne (Domfrontais), whilst the generic appellation can use either of them. Then there follows a lengthy ageing process in wooden casks that typically come from Jerez or Porto. After maturation comes the blending, which is the task of a skilled maitre de chai, or master blender. The different styles that arrive on the market are: Vieux-Réserve (three years in wood), Vieille Réserve-VSOP (4 years in wood) and Extra-Napoléon, Hors d’Age or Age Inconnu that have matured in wood for at least six years. 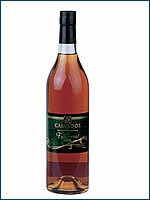 Calvados is traditionally taken after a meal as a digestif or as an accompaniment to strong Normandy cheeses. Locally, it is also very much favored in the middle of a feast, as a celebrated trou normand, so called because it “burns a hole in your stomach” to enable you to tackle the next courses. Simple, elegant, practical. 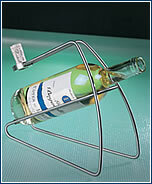 That describes the wine bottle holder “Veritas” by the German company Zack. Lovers of food and fine wine will surely appreciate that after opening the bottle, the cork can be held in a special vent on top. Price: CZK 1,320. Available from: Albertina, Revoluční 24, Praha 1, www.albertina-interier.cz. The hotel will be holding its traditional vinobraní wine festival with barbecue on Saturday, 7th September from 2 pm. Information on tel: 0312-621 648 or www.hotel.cz/la-park..
Amber nectar with a pronounced and very fruity, appley nose and a warming palate with a slightly sharp edge. 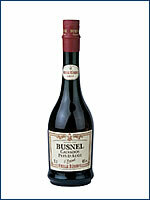 A vital ingredient in flambés dishes. Imported and distributed by: Neubauer & syn. Price: 599 Kč. Copper-colored in appearance, this “calva” displays a complex aroma reminiscent of baked toffee apples with bags of spiced ripe fruit and ample body. This example hails from a specific demarcated region, the Pays d’Auge, and is of deep golden hue with abundant caramelized notes and an elegant oaky finish. 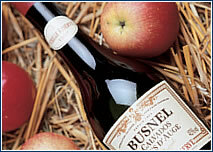 Produced from a blend of calvados varieties from the Pays d’Auge boasting an average age of at least four years, this fine tipple is characterized by an intense apple-orchard palate and its Venetian-gold color. The initial fragrant taste is followed by a distinct savor of vanilla and toasted almonds. Imported and distributed by: Jan Becher Karlovarská Becherovka, Price: 1290 Kč.